Table Topper Displays:Table Topper Displays Feature Portability. Table Topper Displays Feature Maximum Portability and Ease of Use. Table Topper Displays are light weight. Table Topper Displays are durable. Table Topper Displays are very economical. 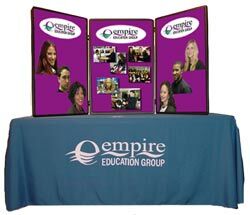 Table Topper Displays are great for entry level trade show exhibits. Table Topper Displays may be custom sized. Table Topper Displays may be up graded. Table Topper Displays are Flexible. Custom graphics and professional photography brought this Table Topper Display to life! Lights and Custom Tablecloth extra. Please call or email for a quote on your custom table throw. Table Topper Displays are made of quality, durable materials. Plastic edges keep the table top display light weight. No sharp edges. A very portable trade show display. Give me a call for further details.